Are you tired of the overused “We are them, they are us” philosophizing associated with many of today’s post-apocalyptic zombie stories? If so, you would do yourself well to pick up the manga series Reiko The Zombie Shop by Rei Mikamoto, the first 6 volumes of which are available in the U.S. from Dark Horse Comics.The emphasis here is on injecting massive amounts of imagination into stories of reanimated corpses, demonic creatures, child murderers and the seemingly innumerable ways the human body can be ripped, slashed and shredded to pieces. The series’ main character is the necromancer Reiko Himezono, a top-heavy high school student who has the ability to resurrect the dead, providing a service coined “Zombie Shop.” Although she does adhere to some semblance of morality, Reiko is clearly in it for the money and she is paid well for her talent by surviving family members, police officers and opportunists seeking closure or information from the deceased. Reiko sends the dead back to their eternal slumber as soon as the customer is satisfied. And though she would like nothing more than to get the job done quickly and cleanly, this unfortunately is rarely (if ever) the case. Once summoned back to the land of the living, the undead exhibit superhuman strength, powered by a need for some particularly nasty and messy revenge on those who wronged them in life. These tales of murder and its inevitable comeuppance could have become predictable over time, but Mikamoto keeps things fresh and moving at a lightning pace by including an ever-expanding cast of characters to replenish the ranks of those being constantly, and rather painfully, dispatched. Introduced early on is the brutal Yurikawa, a psychotic girl whose quest for a new little sister leads to her murdering dozens of children. The vicious nature of these introductory scenes of Yurikawa makes one realize very quickly that all bets are off and any character can die at any time, regardless of how major, minor (or innocent) they may be. Reiko’s abilities are not limited to raising the freshly dead, however. 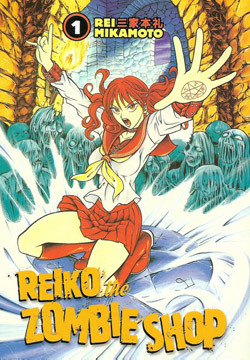 An overarching storyline deals with Reiko’s twin sister and fellow necromancer Riruka who is hell bent on ruling the world with a massive army of zombies under her control. The two battle utilizing beings summoned from hell to hack and slash each other in what can best be described as a demented version of Pokemon, complete with titles that announce the creature’s names and history. The full-tilt gore found in the series is close to unending, even across multiple volumes. The frequent crescendos of out of control violence may make this title off-putting to even those used to “Mature Reader” comics. There is a giddy commitment to taboo-crushing abandon that Mikamoto injects into these stories that, for good or ill, depending on your tastes, sets Reiko comfortably into the darker corner of Japanese manga. Still, the utter exuberance of all of the bloodletting certainly indicates the influence of such films as Evil Dead 2 and Dead Alive where a streak of dark humor runs through the grisliest of scenarios. The character design, particularly that of young women and children, in the Reiko series holds to the familiar Japanese anime equation that a round head + big eyes = utter adorableness. This style and its variations are instantly recognizable as it dominates a significant portion of manga, but to see a seemingly sweet and wholesome looking character thrust into the grisly world of Reiko is bound to leave some level of unease in anyone reading it. However, this cuteness can, on rare occasion, occur sans severed limbs and provide a brief respite from the oft strewn entrails. These brief moments usually occur when Reiko is hanging out with her friends like any another teenager would, or when a story ends on a light note. 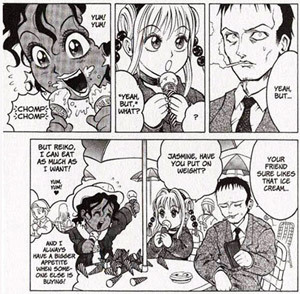 Here Reiko and her ally Jasmine are indulging in some ice cream and are drawn as happy children simply enjoying a treat. Naturally, the page immediately preceding this moment featured a body exploding into pieces from the waist up. Halloween is just around the corner and if you’re like me you’re looking to indulge in some classic horror comic material as well as something contemporary — something with a bit of bite to it. Reiko The Zombie Shop wont just bite you, it will rip your arm completely off and force you to watch as it swallows it whole. Sensational, fearless, top-of-the-line horror manga for those gutsy enough to seek its immoral pleasures out for themselves.